In a solemn, spartan ceremony, president of the republic Karolos Papoulias was bestowed with the “Raoul Wallenberg Centennial Medal” for his contribution to the defense of human rights and especially in promoting and defending the memories of thousands of Jews from Nazi atrocities. 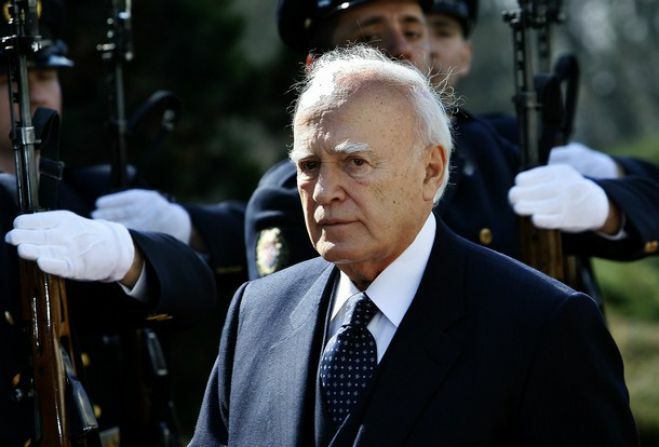 Mr. Papoulias noted his honor and the honor of the Greek people in being bestowed the award as he received it from the Raoul Wallenberg Foundation’s Chairman Argentinian of Greek-Armenian descent Eduardo Eurnekian and the foundation’s founder Baruch Tenebaum. The Greek president reminded his audience that holocaust deniers have no place in the European family. The president also made special mention of the coalition of Christian and Jewish Greeks in the fight against barbarism, that saw 65,000 Greek Jews perish. The president of the Central Board of Jewish Communities Beniamin Albalas and Mr. Eduardo Eurnekián lauded the efforts of Mr. Papoulias for the perpetuation of hisorical memory and the condemnation of the revival of fascist phenomena. The ceremony took place in the presence of the Archbishop Ieronymos, the Greek interior minister the chief rabbi of Athens Isaak Mizm and the president of Jewish communities from Greek cities, as well as the ambassadors of the US, Sweden,Israel, Armenia, and Germany. In a touching moment, Mr. Papoulias met with Greek holocaust survivors Rosa Aser-Pardo, Iosif Ventura, and Eftychia Nahman, and the people that saved them Lydia Theodoraki-Dimaki,Evangelia Kypraiou, and Katia Mavrogeorgiou-Aggelopoulou.